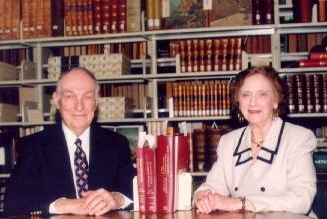 The Crawford Coleridge Collection, established in 1985, is based on and continues to benefit from gifts from the personal library of Professor Emeritus Walter B. Crawford and Ann M. Crawford, and it is supported in part by the Crawford Coleridge Collection Endowment. It is not intended to be a collection of expensive first editions of Coleridge's works, or of original Coleridge-related art, collected for their rarity and monetary value, although many of the items are rare and valuable. Rather it is designed as a working collection of materials in all the categories covered in Samuel Taylor Coleridge: An Annotated Bibliography of Criticism and Scholarship (3 vols., 1976, 1983, 1996, and the selectiveSupplement 2003), along with a convenient reference collection pertaining to English Romanticism, Coleridge's contemporaries, and earlier authors in whom Coleridge was particularly interested. The principal criterion is the usefulness of the materials to scholars with special research interests in Coleridge and his contemporaries during the English Romantic Movement and their influence down to our own time, as well as to any readers desiring to see hard-to-find items annotated in the Bibliography, especially in the Crawford volumes, or to learn other locations of those items. Part I: editions of Coleridge works (or of Coleridge works with works of two or three other authors), including scholarly, school, and gift editions, especially those with editorial matter or illustrations; and translations of Coleridge works or parts of works. Part I: basic scholarship such as concordances, bibliographies, bibliographical or textual studies, and items dealing with Coleridge manuscripts; and original biographies. Of critical treatments, the closer to Coleridge's text, the better: fact--even possible fact--has priority over opinion. Part II.10: Coleridge-related works of art other than portraits, other than art published in portfolios or as book illustrations (such published art is included in Part I), and other than the popular art in Part II.6. Included are paintings in various media, sculpture, posters, book jacket illustrations printed on the jacket but not in the jacketed book, and literary maps printed separately. Coleridge-related music. Part II.7-1 items include both scores and recordings of musical settings of Coleridge's poems (or parts of poems) and a few instrumental compositions inspired by Coleridge or his writings. Included are both published and unpublished materials, and an occasional other publication relevant only to Coleridge- related music. Part II.7-2 items include some of the considerable number of musical compositions, especially those produced in recent decades and most of these also recorded, which cannot be considered musical settings of even parts of Coleridge's works, but in which Coleridgean elements are used in some creative fashion that shows how for their writers and composers the works, life, and personality of Coleridge have provided touchstones of feeling and have become an integral part of their store of ideas and tool-kit of expression. Part I: works of scholarship and criticism in languages other than English with Coleridge material meeting the criteria stated in paragraphs 1-3 above, especially items not listed in the annual MLA International Bibliography. Recordings of filmed or broadcast drama with Coleridge allusions or with elements of plot, characterization, setting, or style drawn from Coleridge, are also included when the Coleridge material is extensive or highly unusual. Part I: letters, journals, diaries, memoirs, and autobiographies containing extensive first-hand testimony of the way Coleridge touched the authors. Part II.5: verse and prose continuations and completions, by other authors, of Coleridge's uncompleted poems, Christabel andKubla Khan. Part II.4: parodies and imitations of particular works by Coleridge, or parts of works, or of his general prose or verse style; imaginary conversations and correspondence of Coleridge with other more or less well-known persons; condensations, abridgments, re-tellings (as for children) of his works, and adaptations of his works to otherwise original works by other authors. Part II.4 items include both verse and prose. Part II.3: poems (other than those entered in Parts II.4 and II.5) addressing Coleridge, poems concerned with Coleridge as subject, and poems in which Coleridgean elements are used in some creative fashion. Part II.1: works of prose fiction, published plays and filmed or broadcast drama, and comic books, in which Coleridgean elements are used in some creative fashion. In some of the better items in this category, the passages concerned are interpretive commentaries on Coleridge of the same kind as those found in non-fiction writings annotated in Part I. And some of the works annotated are outstanding creative achievements in their genre, their imaginatively integrated use of Coleridge material contributing significantly to the achievement. Contributions to the Crawford Coleridge Collection or to the Collection Endowment will be gratefully acknowledged by the Dean of the University Library. Persons contemplating such gifts should contact the Special Collections Department, University Library, California State University, Long Beach, CA 90840.